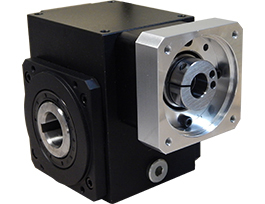 The EJP 051 is a rugged, reliable performer for any dynamic servo application. This product is an ideal fit for machine builders transitioning from mechanical or hydraulic systems to all-electric servo drives. Unlike traditional worm gearboxes out on the market, the EJH utilizes a globoidal gear mesh, resulting in 300% shock load capacity and a quiet, smooth running drive.